The basic design of the sub-irrigated (self-watering) bucket planter shown in this cutaway diagram is sound but it has a potentially fatal flaw (or two). Note the red funnel at the bottom used to create a soil wick. Unfortunately, it will become a “choke point” over time as the roots grow down into the neck of the funnel. I also don't see any indication of an overflow drain hole to prevent flooding the planter in a rain storm. A much better idea is to use a plastic container such as a plastic drink cup or yogurt container to create the soil wick. See this post about root growth in recycled pop bottle planters. The Greenroof Growers blog has an excellent tutorial on making sub-irrigated bucket planters. The blog is written by experienced growers using sub-irrigation planters on Chicago area rooftops. I would highly recommend reading and following their instructions. The diagram above is from an article in Mother Earth News written by the author of the book Incredible Vegetables from Self-Watering Containers: Using Ed's Amazing POTS System. Incidentally, I’ve seen this funnel idea elsewhere on the web. Don’t use a funnel for the wicking chamber. It’s a bad idea. Over time you will observe very vigorous root growth in pop bottle planters. That's good news but you will need to carefully observe the roots in the neck (wicking area) of the bottle. Over time, the roots will displace the soil in the neck and you will lose capillary action. That's what happened with this Aglaonema. The solution is simple and takes but a few minutes. Push the plant out of the planter by poking your finger through the neck. Cut off the protrusion of roots at the bottom of the root system with scissors or pruners. Don't worry you won't hurt the plant. Clean the polyester wick or insert a new one. Add a bit of fresh potting mix and reinstall the plant. Add a measured amount of water and you're good to go. 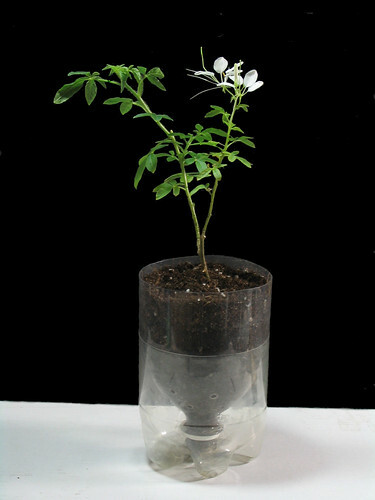 Note: If the soil has dried out (as happened with this plant), water the soil from the top and let it drain through. Be sure to thoroughly moisten the soil. The lighting design firm Office for Visual Interaction (OVI) won a streetlight design competition sponsored by the City of New York. This may be the LED powered streetlight of the future in the city. More than likely we will also be providing light for indoor plants using LED lamps like these in our homes and offices. Inadequate light is clearly the most significant limiting factor to expanding the use of plants in buildings. LED lighting along with better education about sub-irrigation will be of major help in the spread of urban greenscaping for both food production and environmental purposes. This is from the OVI website. Click on the photo for a larger view on Flickr. Friend Al gave me this cutting a while back. I rooted it in a pop bottle planter with a "humidity hood". Much to my surprise it has bloomed at Christmas time. Al also said that it has a nice scent. My sense of smell is not very good so I can't tell. This is a larger view on Flickr. Do you know what it is? It's a mystery to me. In any case, this is a Merry Christmas wish for those who celebrate Christmas and a happy holiday wish to everyone. Thanks for reading this past year. The little tree on the right was made from a bundle of cuttings that were rooted in a pop bottle planter with a "humidity hood" in April 2008. The tabletop tree on the left was grown on from a 4" pot size plant. It's about 3 years old in the photo. It's growing in a plastic colander inside the ceramic bowl. It won't take many years for the little tree to grow into a tabletop tree like the one on the left. With proper pruning, it can someday become a true bonsai. The key essentials are adequate light, sub-irrigation, regular pruning and patience. 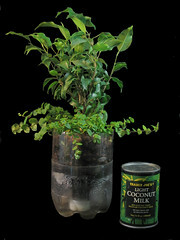 Little Ficus trees in pop bottle planters make nice gifts. They are a good pet for a child who can't have an animal pet for whatever reason. The tree and the child can spend a lifetime together. With proper care, these are most definitely sustainable plants. They are doubly green. Is this a Too Wet Pot? A reader posted a comment asking if I had any experience with this self-watering planter called the Wet Pot. This same type of "seep watering" is used in many African Violet planters like these. The only difference here is that the outer container is clear. Although I haven't used them, I wouldn't spend my money for this method. The most significant problem is that over time soluble salts in the water will clog the porous ceramic. The catch 22 choices are between over watering and under watering. Here's why. It's a bad idea to constantly top off the water in the reservoir. In low light, this will surely lead to over watering and eventual plant death. However, maintaining moisture in the ceramic will help to some degree in keeping water flowing to the soil mix inside the planter. If you do it the right way and measure soil moisture instead of reservoir level, you will most likely clog up the planter. When the reservoir goes dry (as it should periodically), the salts (minerals) in the water will precipitate out into a crystalline form that will clog the porosity of the ceramic inner planter. The dry salts can also burn plant roots, hair roots in particular. With so many no-cost, low-cost sub-irrigation methods such as pop bottle planters and 'aquapads', why would I spend from $25 to $45 (plus shipping) for these planters? The answer is that I wouldn't. A reader who grows herbs in sub-irrigated soda bottle planters, posted a link to this planter she saw in IKEA. It’s called the PS FEJÖ self-watering planter. With a 15 3/8" diameter and 13 3/4" tall (with casters) it's obviously meant for floor plants. It's a nicely designed planter but a couple of things bother me about it. There is only one size planter and the instructions are weak if not non-existent. IKEA sells many tabletop size plants and my concern is that buyers will "over pot" smaller plants in this planter. The result will likely be plant decline or death due to over watering. It would be good if IKEA also had at least one smaller planter for 6" to 8" pot size plants like the one on the right. Unfortunately they don't. The photo on the right is scaled down from the photo on the left. Casters, of course, wouldn't be needed for a tabletop size planter. Many people over water plants in self-watering planters due to a lack of understanding of how they work. Follow these guidelines and you're not likely to over water plants in "self-watering" planters. 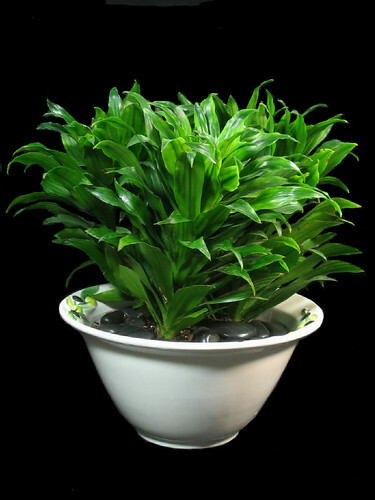 This is an ideal tabletop plant to display on a pedestal as discussed here. Rhapis palms can be expensive so this is a good way to get extra height from a smaller plant. Rhapis excelsa is perhaps my favorite indoor plant. This palm is sub-irrigated in a clear plastic basket liner sitting on top of expanded clay pebbles the same as this Dracaena. The 'planter' is really a ceramic bowl from a discount store like Marshall's, T.J. Maxx or Ross Dress for less. These stores are an excellent source of decorative bowls from around the world at reasonable prices. Read more about Rhapis palms here. I see photos of plants scrunched into corners like this all the time. 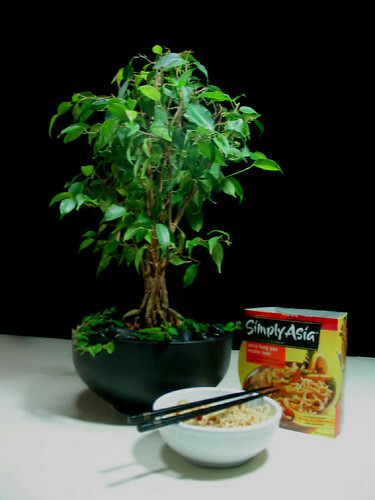 A better solution is to use a tabletop plant on a pedestal. It will look more in scale with the small space, will be easier to maintain and will cost less. Perhaps the biggest benefit is that it will be easy to rotate different plants into the location and change the look at will. Here are pedestals of every type and price range. 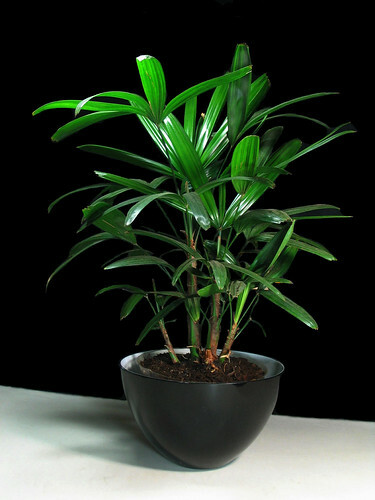 This tabletop plant is a Dracaena Janet Craig ‘Compacta’. It is an excellent low light tolerant plant (as low as a 25-50 foot-candle range similar to Pothos). It uses very little water, as you will discover for yourself if you use the methods outlined here. The plant was made up from three 4” plants (like this one) which are growing in an inexpensive clear plastic basket liner. They are commonly available from home improvement stores like Home Depot and Lowe’s. To facilitate wicking action, use a hot poker to make a series of holes around the bottom near the edge and some in the middle of the basket liner. These are not for drainage but rather for water to rise by capillary action from the bottom. Note that the soil surface is covered with decorative polished stones. There is no need for finger poking. 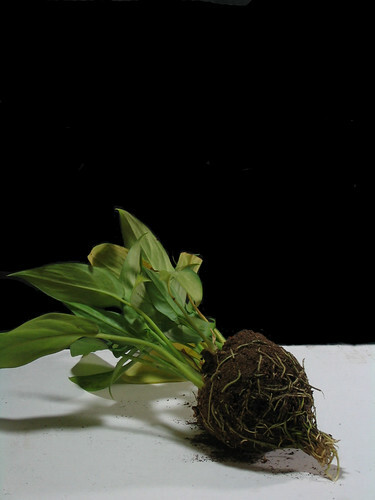 When you lift the plant in its basket liner you can clearly see the status of the soil and root system. An ‘aqua pad’ or pad of polyester batting material will facilitate the start of capillary action. This simple wicking method does not require a reservoir and there will be no root rot if you measure the water and add only what the plant needs. I call this watering in the zone. You will not need a saucer. The decorative ceramic bowl has no drain holes. Bowls like this are widely available and sold as housewares rather than planters. Shop for them in stores like T.J. Maxx, Marshall’s, Ross Dress for Less, Bed, Bath & Beyond and Target among others.